When the TCR binds Ag it is phosphorylated, internalized, and degraded. We wished to examine whether this process was accompanied by a specific concomitant increase in TCR mRNA levels. To do this, PBMC and a T cell clone were cultured with a series of superantigens and an alloantigen. Only T cells specifically responding to an antigenic stimulus had increased levels of TCR β-chain variable (TCRBV)-specific mRNA. This response was apparent after 48 h, peaked around 72 h, and was still elevated after 7 days. Increased gene transcription appeared to be driven solely by Ag as specific Ag depletion prevented culture supernatants transferring this effect. The level of TCRBV mRNA elevation was not influenced by the stimulating Ag, but appeared dependent on the gene encoding the stimulated TCR. Reporter gene assays, using cloned TCRBV gene promoters, confirmed both that TCR gene transcription rises after stimulation and that basal and stimulated levels of TCR transcription vary between different TCRBV genes. These data conclusively demonstrate that there is no direct relationship between TCRBV mRNA and T cell number, and that future repertoire studies must take both factors into account. The T cell recognizes Ag using its TCR. Upon binding Ag, both the TCR and the associated CD3 complex are phosphorylated, internalized, and degraded (1, 2, 3, 4). Initially, signaling from tens of thousands of TCRs may be required to trigger autonomous T cell activation (5). Compensatory changes in T cell polarization and costimulatory signals appear to lower the numbers of receptors required for subsequent activation thresholds to be achieved (4, 6, 7). Ultimately, however, one might predict that the critical numbers of TCRs required at the cell surface for continued triggering could only be maintained by de novo receptor synthesis. Indeed, there is evidence that both anti-CD3-triggered and phorbol ester-induced T cell protein kinase C (PKC)3 activation increases TCR mRNA levels (8, 9, 10). This increase is due to a direct effect on gene transcription (10). However, other factors including IL-2, IL-8, and IL-16 can also activate T cell PKC (11, 12, 13, 14), and it is unclear whether increased TCR gene transcription is an Ag-specific phenomenon. Few studies have specifically examined the rate of TCR gene transcription following Ag triggering. There is a reported increase in the numbers of TCRBV2S1 mRNA transcripts per Vβ2.1+ T cell in patients suffering acutely from Kawasaki disease (15, 16). This increase returns to control levels after successful treatment with antibiotics. However, the same authors could not demonstrate a similar increase in gene transcription in Vβ12+ T cells stimulated with staphylococcal enterotoxin B (SEB) (16). Another study, examining levels of TCR β-chain mRNA by in situ hybridization, found increased transcription to be generally present in the bronchial alveolar lavage lymphocytes in sarcoidosis (17). In this work we were interested to investigate whether Ag stimulation selectively increases TCR β-chain variable (TCRBV) gene transcription. Further, as each TCRBV gene has its own distinct upstream promoter (18, 19, 20, 21), we were interested to see whether the levels of gene transcription vary between different genes. We report that Ag stimulation does selectively increase TCRBV gene transcription and that both resting and triggered TCRBV gene transcription levels are gene specific. We propose that, if the resting and triggered transcription levels of individual TCRBV genes are known, Ag-triggered T cells may be identified in unseparated lymphocyte populations without prior knowledge of either the stimulating Ag or responding TCR structure. Peripheral blood samples were obtained from healthy adult volunteers. RPMI 1640, glutamine, HEPES, FBS, and antibiotics were obtained from Life Technologies (Paisley, U.K.). All the other reagents, except where stated, were obtained from Sigma-Aldrich (Poole, U.K.). SEB, staphylococcal enterotoxin C1 (SEC-1), staphylococcal enterotoxin C2 (SEC-2), and toxic shock syndrome toxin-1 (TSST-1) were obtained from Toxin Technology (Sarasota, FL). Anti-Vβ3 and anti-Vβ2 FITC-labeled mAbs were the kind gift of Professor Art Boylston (University of Leeds, Leeds, U.K.). FITC-labeled anti-Vβ17 (Coulter Electronics, Luton, U.K.) and peridinin chlorophyll protein-labeled anti-CD3 (Becton Dickinson, San Jose, CA) were obtained commercially. Mononuclear cells were separated from heparinized peripheral blood using Ficoll gradient centrifugation (Amersham Pharmacia Biotech, St. Albans, U.K.). Cells were cultured at a density of 2 × 106/ml in RPMI 1640 with 10% heat-inactivated FBS, 2 mM glutamine, 10 mM HEPES buffer, 100 IU/ml penicillin, and 100 μg/ml streptomycin. The human anti-HLA-DRB1*0401-specific Vβ2.1+ T cell clone used, AY27, was the kind gift of Professor Bill Ollier (University of Manchester, Manchester, U.K.). The clone was stimulated weekly with irradiated (4500 Gy) HLA-DRB1*0401+ EBV-immortalized DAL B cells at a responder-to-stimulator ratio of 10:1. The RPMI 1640 medium described above was used with the exception that it was supplemented with 5% Lymphocult-T (Biotest, Dreieich, Germany) and the FBS was substituted with 10% heat-inactivated human serum. After 2 days, 50% of the culture volume was replaced with medium containing fresh Lymphocult-T. The cells were rested for a further 5 days after which they were split and the cycle of stimulation was repeated. Before TCRBV gene transcription analysis was performed, the T cells were rested for 5 days. Instead of using DAL B cells, the T cells were cultured in irradiated, syngeneic EBV-immortalized B cells (CHOP40) with 5% Lymphocult-T on the first of the 5 days. Further Lymphocult-T was added, as before, after 2 days. After a further 3 days, the T cells were washed and counted and the stimulation experiments were begun. In the stimulation experiments, the cloned T cells (1 × 106/ml) were cultured with irradiated CHOP40 or DAL B cells at a responder-to-stimulator ratio of 10:1. T cells were also incubated with 10 ng/ml TSST-1 or 100 ng/ml SEB in the presence of 1 × 105 irradiated CHOP40 B cells. After 3 days, the cells were harvested, counted, stained, and analyzed, and TCRBV-specific mRNA levels were measured as described. Intracellular TCRBV mRNA levels were derived by dividing the numbers of TCRBV-specific mRNA molecules by the number of specific Vβ+ T cells in a fixed aliquot of mononuclear cells. Numbers of specific TCRBV mRNA molecules were obtained using a quantitative contaminant RT-PCR-ELISA, and specific T cell numbers were obtained using FACS analysis (see below). This assay is a modification of the method of Kohsaka et al. (22). Total RNA was extracted in a volume of 50 μl from 5 × 105 lymphocytes using the RNeasy kit (Qiagen, Crawley, U.K.) and cDNA was generated from 10 μl of this RNA using an oligo(dT) primer and a reverse transcription kit according to the manufacturer’s instructions (Promega, Madison, WI). For each TCRBV mRNA to be measured, four separate PCR reactions were set up, each containing 1 μl of wild-type cDNA or wild-type plasmid and a different known amount of gene-specific mutant competitor. Each reaction was conducted in a 50 μl volume with 20 pmols of each primer and 1.0 U “Red Hot” Taq DNA polymerase, and at pH 9.0 using the reaction buffer “288” supplied by the manufacturer (Advanced Biotechnologies, Epsom, U.K.). The final reaction mixture also contained 1 M betaine, 2 mM MgCl2, and 200 mM dNTPs. The primer sequences used were: BV2S1 (sense), 5′-CACATACGAGCAAGGCGTCG-3′; BV3S1 (sense), 5′-TCTAGAGAGAAGAAGGAGCGC-3′; BV17S1, 5′-GATATAGCTGAAGGGTACAGC-3′; βPCRU (sense), 5′-TGTTCCCACCCGAGGTCGC-3′; and TCRBC (antisense), 5′-AAGCCACAGTCTGCTCTACC-3′. PCR products were purified using the QIAquick PCR purification kit (Qiagen) to remove unincorporated primers, eluted in 90 μl sterile distilled water, and diluted 1:2 with autoclaved MES/EDTA buffer (50 mM MES, 1 mM EDTA). Forty microliters of sample were added to each of four wells of the amine-coated no. 2388 microtiter plate (Corning, High Wycombe, U.K.) along with 40 μl of cross-linking solution (40 mg EDC, 0.543 mg N-hydroxysulfosuccinamide (Pierce, Rockford, IL) in 5 ml sterile distilled water) before being incubated at 37°C overnight. Plates were washed three times with PBS (pH 7.6) before a 10-min, room-temperature incubation with 0.1 M NaOH to denature the covalently bound PCR products. Wells were washed once with 0.1× SSC and then twice with HW6 buffer (6× SSC with 0.1% v/v N-lauroylsarcosine) before blocking with 5% (w/v) Marvel dried skimmed milk powder in HW6 (Premier Beverages, Stafford, U.K.) for 30 min at 37°C. The appropriate 5′ biotinylated probes (wild-type-specific, 5′-CATCAGAAGCAGAGATCTCC-3′ diluted to 5 pmol/ml; mutant-specific, 5′-GATGTCAAGCTGGTCGAGAA-3′ diluted to 1.875 pmol/ml), diluted in HW6, were hybridized to the templates during a 90-min incubation at 42°C. Plates were washed three times with HW2 buffer (2× SSC with 0.1% v/v N-lauroylsarcosine) and once with buffer B (buffer A (100 mM Tris-HCl (pH 7.5), 800 mM NaCl) + 1.0% (w/v) BSA) before a 1 h incubation at 37°C with ABC streptavidin peroxidase (Dako, Cambridge, U.K.) diluted 1:10000 in buffer B. The plate was washed once with buffer B and five times with buffer A. A 3,3′,5,5′-tetramethylbenzidine (TMB) substrate solution, containing 200 μl TMB solution (100 mg TMB in 10 ml DMSO) and 2 μl H2O2 made up just before use in 20 ml phosphate-citrate buffer (pH 5.0) (25.7 ml 0.2 M dibasic sodium phosphate + 24.3 ml 0.1 M citric acid) was added, and color was allowed to develop. The reaction was stopped with 1.0 M H2S04 and the OD read at 450 nm with a reference measurement at 630 nm on a MRX ELISA reader (Dynex Technologies, Billinghurst, U.K.). Wild-type TCRBV sequences were amplified from cDNA using the combination of TCRBV-specific and TCRBC primers described above. The PCR products were purified using the QIAquick PCR purification kit and cloned into the pGEM-T easy vector according to the manufacturer’s instructions (Promega). Cloned templates were sequenced to exclude any PCR error. Specific contaminant templates were generated for each TCRBV gene to be measured. In these templates, 20 bp of the TCRBC gene segment was replaced with 20 bp derived from a similar region of the TCRAC gene segment. These substitutions did not alter the length, the PCR primer annealing sequences, or the overall GC:AT content of the templates. They were generated from cloned wild-type templates using PCR gene sequence overhang extension as previously described (23, 24). In addition to the TCRBV-specific and TCRBC-specific primers above, the mutational primers βmod1s 5′-AAGCTGGTCGAGAACACACCCAAAAGGCCACAC-3′ (used in conjunction with TCRBC) and βmod2as 5′-ACCAGCTTGACATCGCTCAAACACAGCGACCTC-3′ (used in combination with TCRBV-specific primers) were also used (Fig. 1⇓A). Contaminant templates were cloned into the pGEM-T easy vector and sequenced. A mutant TCRBV17S1 template was generated to test whether all mutant templates performed equally well in the PCR-ELISA system. In this 566-bp template, 44 bp of the TCRBV17S1 gene segment was replaced with 44 bp derived from the TCRBV2S1 gene segment of which 36 bp differed. The N region, TCRBD, TCRBJ, and TCRBC sequence of this template was unaltered by this mutation. 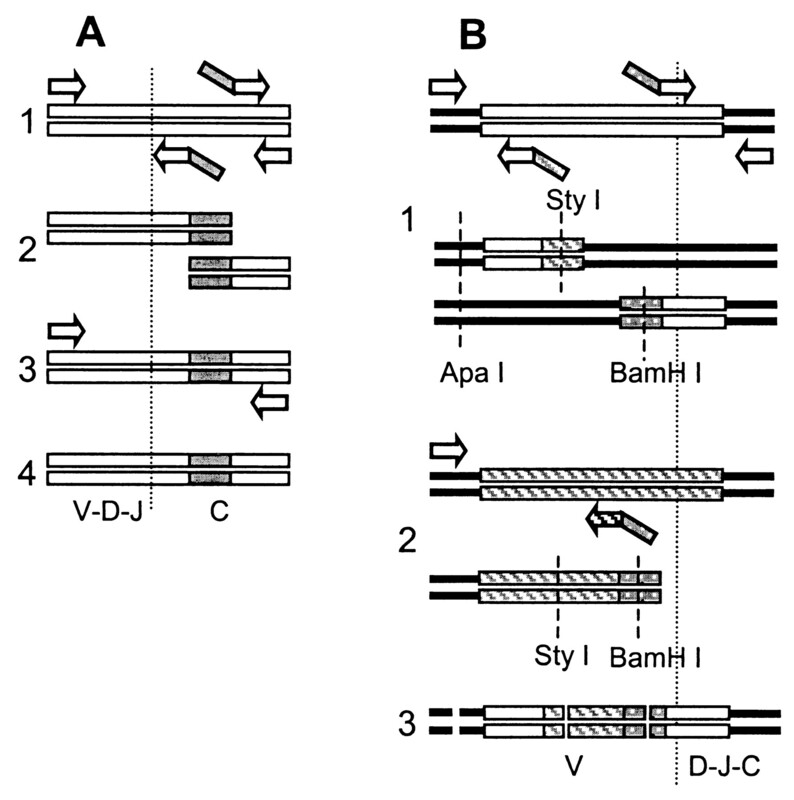 The upstream portion (bases 1–42) of the TCRBV17S1 sequence was amplified using the BV17S1 primer in combination with BV17S1sty1 primer (5′-TTGCTACCTTGGTCCTTCTTCTCCCGAGAGAC-3′), which introduced a StyI restriction site into the PCR product. The downstream portion of the TCRBV17S1 template (bases 86–566) was amplified using the BV17S1bamh1 primer (5′-TCAAGGTCCCTTTCTATCTCTGTGCCAGTAG-3′) in combination with the TCRBC primer. This introduced a BamHI restriction site into this TCRBV17S1 PCR product. The TCRBV2S1 template was amplified using the BV2S1 primer in combination with the BV2S1bamh1 primer (5′-TACTGGATCCCTTGTCCTTCTCGACGCCTTG-3′), which included a downstream BamHI restriction site. All three PCR products were cloned into pGEM-T easy and sequenced. The TCRBV17S1 upstream fragment was released by ApaI and StyI restriction. The TCRBV2S1 substitution fragment was released by StyI and BamHI restriction. Both of these fragments were simultaneously ligated into the pGEM-T easy vector containing the downstream part of the TCRBV17S1 template which had been previously restricted with both ApaI and BamHI (Fig. 1⇑B). The final construct was then sequenced to make sure that no unwanted mutations had been introduced. A double-construct template containing a single copy of both wild-type and mutant probe sequences was generated by restricting an amplicon of a cloned TCRBV2S1 wild-type sequence with BalI and an amplicon of a cloned TCRBV2S1 mutant sequence with HpaI for 2 h at 37°C. The 408-bp HpaI mutant fragment (containing TCRBC primer site and mutant probe sequence) was ligated to the 445-bp BalI fragment from the wild-type sequence (containing the TCRBV2S1 primer site and the wild-type probe sequence), cloned into pGEM-T easy, and sequenced. The resultant double construct could then be amplified by a standard PCR using a combination of TCRBV2S1 and TCRBC primers and the resultant amplicons always contained equimolar amounts of each probe sequence. Cells were counted on a SE-9000 hematological analyzer (Sysmex, Milton Keynes, U.K.). Aliquots of 105 cells were incubated on ice with the relevant Abs appropriately diluted in FACS wash buffer (PBS (pH 7.6) + 0.02% (w/v) sodium azide and 2% (v/v) normal human serum) for 30 min. After this, cells were washed once with FACS wash buffer and resuspended in a 1% (w/v) paraformaldehyde solution in PBS. Normal rabbit Ig or affinity-purified rabbit IgG anti-SEB (Toxin Technology) were covalently linked to CNBr-activated Sepharose 4B beads (Amersham Pharmacia Biotech). Pooled supernatants from SEB-stimulated cultures were passed three times through 1 ml columns containing one or the other bead. The columns were eluted with 0.5 M acetic acid (pH 4.0) after each passage. Supernatants were passed through a 0.2 μm syringe filter (Nalgene, Rochester, NY) and used to culture lymphocytes as the untreated RPMI 1640 medium above. A region including ∼300 bases upstream and 20 bases downstream of the translational start codon of the TCRBV2S1, TCRBV3S1, and TCRBV17S1 genes was amplified by PCR. The primers used were as follows: for TCRBV2S1, 5′-TACTTAGTCGACGTAGCTGGGATTACAGGTGTCC-3′ (upstream) and 5′-CGACGCAGATCTAGAAGCAGCAGCATCTTCCGTG-3′(downstream); for TCRBV3S1, 5′-TTCAAGGTCGACTGTGCAAGCAGTCTAGACACAC-3′ (upstream) and 5′-CACAGGAGATCTAGGCCACACGACAGAGGAGC-3′ (downstream); and for TCRBV17S1, 5′AACAACGTCGACGCTCCTGGAGTAACCCAAACC-3′ (upstream) and 5′-CGACGTAGATCTCAGCAGAGCACCTGGTTGCTC-3′ (downstream). The amplified promoters were cloned into the pXP2 firefly luciferase-expressing vector (25) using SalI (upstream) and BglII (downstream) restriction sites introduced into the PCR primers. All promoter constructs were sequenced to ensure there was no PCR error. Jurkat T cells (1.5 × 107) in log phase growth were transfected with 10 μg of each pXP2 promoter construct and 20 ng of the sea pansy luciferase-expressing vector, pRL.TK, as a cotransfection control. Transfection was by electroporation (320 V, 2250 μF, and ∞ Ω) using the Easyject plus electroporator (EquiBio, Monchelsea, U.K.). Transfected cells were cultured at a density of 1.5 × 106/ml for 40 h before being harvested and lysed, and both luciferase activities were measured independently using the Dual Luciferase Assay kit (Promega) on a LB9501 luminometer (EGG-Berthold, Milton Keynes, U.K.). Results are expressed as the ratio of relative light units obtained from the experimental pXP2 vector divided by those obtained from the cotransfected control. Overall differences between groups were established using the Kruskal-Wallis test. Individual comparisons between groups were performed using the nonparametric Wilcoxon rank sum test. Using a cloned wild-type (WT) TCRBV3S1 sequence as a starting template, the ELISA was able to detect the product obtained from as little as 10 molecules of DNA per reaction (Fig. 2⇓A). A similar sensitivity was seen when the mutated TCRBV3S1 sequence was used (Fig. 2⇓B). Absolute specificity was observed for wild-type and mutant probes over the range of 101–107 initial template molecules per reaction (Fig. 2⇓, A and B). Moreover, using a construct containing both a single wild-type and a single mutant annealing sequence, both probes bound with equal affinity over a range of 1–106 starting templates per reaction (Fig. 2⇓C). Using a TCRBV17S1 template, the assay could reliably distinguish 10-fold differences in starting template number. It measured between 103 and 105 initial molecules with interassay coefficients of variation of 15, 22, and 17%, respectively (Fig. 3⇓). In practice, the assay uses a single mutated contaminant template to quantify polyclonal cDNA templates. Therefore, it was important to assess the effect of recombinatorial diversity on the accuracy of measurement. To do this, five separate TCRBV17S1 cDNAs were cloned (Table I⇓). mutants of the no. 1 and no. 7 clones were made. Fifteen thousand molecules of each of the clones were measured over an 8-wk period using only the no. 7 mutant as a contaminant. To assess the effect of the junctional diversity on the accuracy of measurement, the PCR was conducted with two independent sets of primers. In the first reaction, the downstream TCRBC primer was used in combination with the upstream TCRBV17S1-specific primer. In the second reaction, the junctional region was bypassed using an upstream primer lying in the constant region (βPCRU) in combination with TCRBC primer. The results (Fig. 4⇓A) show that there was no significant difference in the values obtained with any of the TCRBV17S1 clones measured using the no. 7 mutant. Furthermore, bypassing the V, D, and J regions did not influence the accuracy of measurement. The values obtained using this reaction were not significantly different from the values obtained using the BV17S1 upstream primer. In a separate experiment, the no. 7 and no. 1 clones were also measured using the no. 4 mutant as a contaminant and again no significant difference between the measurements was obtained (data not shown). However, if a fragment of the TCRBV2S1 gene segment was inserted into the TCRBV17S1 gene such that it altered the no. 7 clone from its wild-type by the same degree as the no. 7 clone differed naturally from the no. 4 clone, then the accuracy of measurement was profoundly affected (p < 0.005). 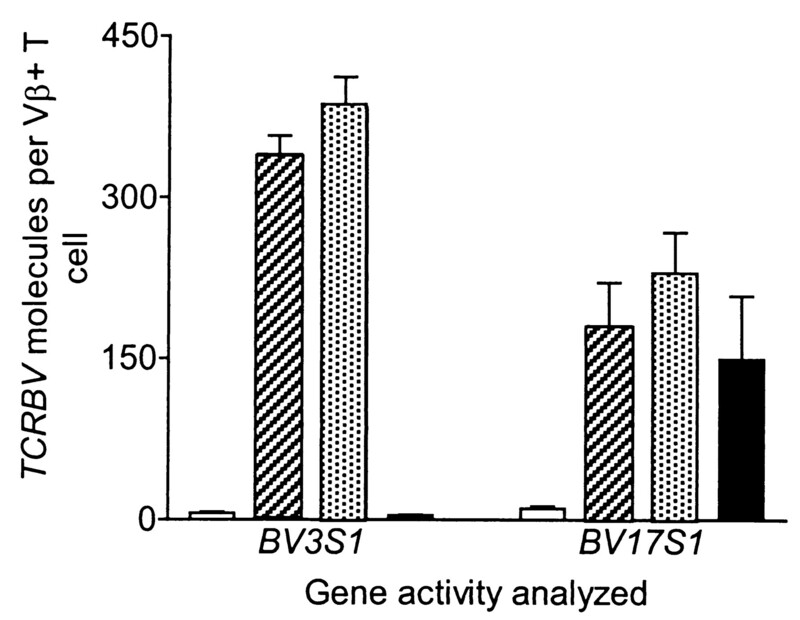 Once the βPCRU primer was used to bypass this mutation, there was no significant difference between the accuracy of measurement of either the wild-type- or BV2S1-mutated templates (Fig. 4⇑B). These experiments demonstrate that physiological mutations do not affect the accuracy of measurement and show that a single mutated contaminant template can be used to measure a range of TCRBV-family specific cDNA sequences. Mononuclear cells obtained from peripheral blood were incubated in culture medium alone or medium supplemented with 100 ng/ml SEB (Fig. 5⇓). No significant elevation in intracellular TCRBV17S1 mRNA was observed until 2 days after incubation with SEB (p = 0.005). 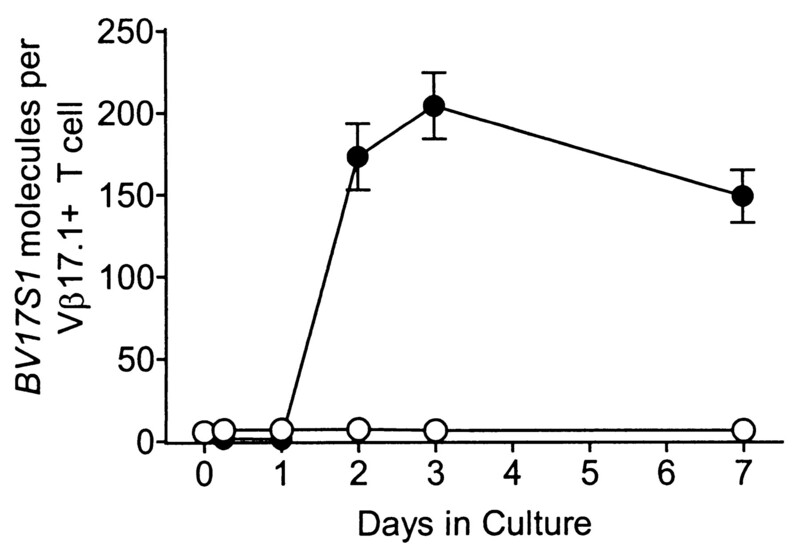 The intracellular mRNA levels peaked at day 3, but significant elevation was still observed after 7 days in culture. From this point onwards, all measurements of TCRBV mRNA levels were made 3 days after Ag stimulation. PBMC from a single individual were incubated in medium alone or medium supplemented with SEB, SEC-1, or SEC-2 (Fig. 6⇓). All three superantigens stimulated significant increases in intracellular TCRBV17S1 mRNA levels (p < 0.05, compared with control cultures), but only SEB and SEC-1 induced increased TCRBV3S1 mRNA production (p < 0.05, compared with control or SEC-2 cultures). The intracellular TCRBV17S1 mRNA levels induced by SEB, SEC-1, or SEC-2 did not significantly differ from each other. 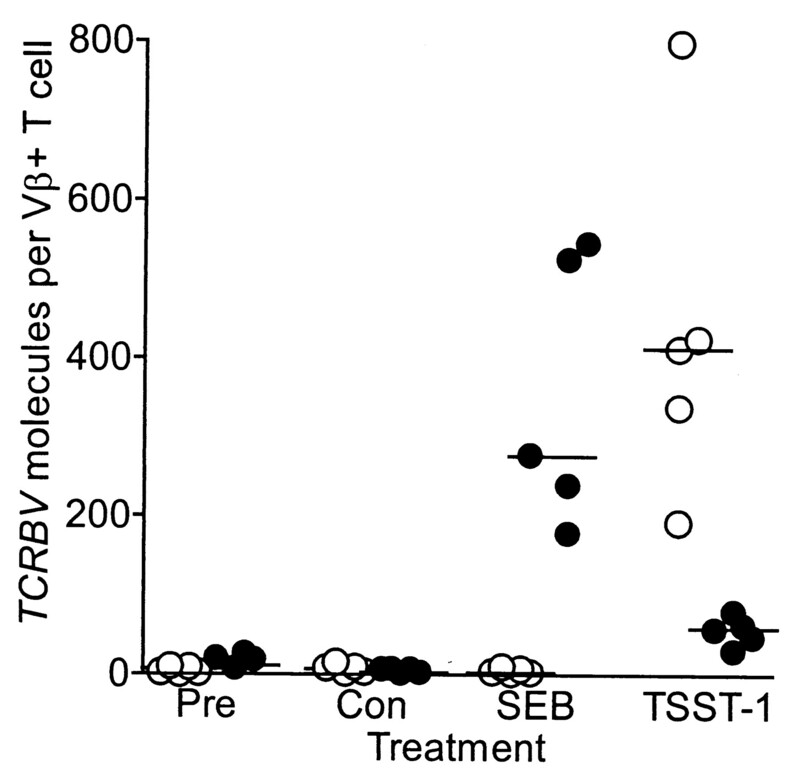 Similarly, there was no significant difference in the TCRBV3S1 mRNA levels stimulated by SEB or SEC-1. The numbers of TCRBV-specific mRNA molecules per cell were consistently higher in the stimulated Vβ3.1+ T cells than Vβ17.1+ T cells (p < 0.05, in all cases). 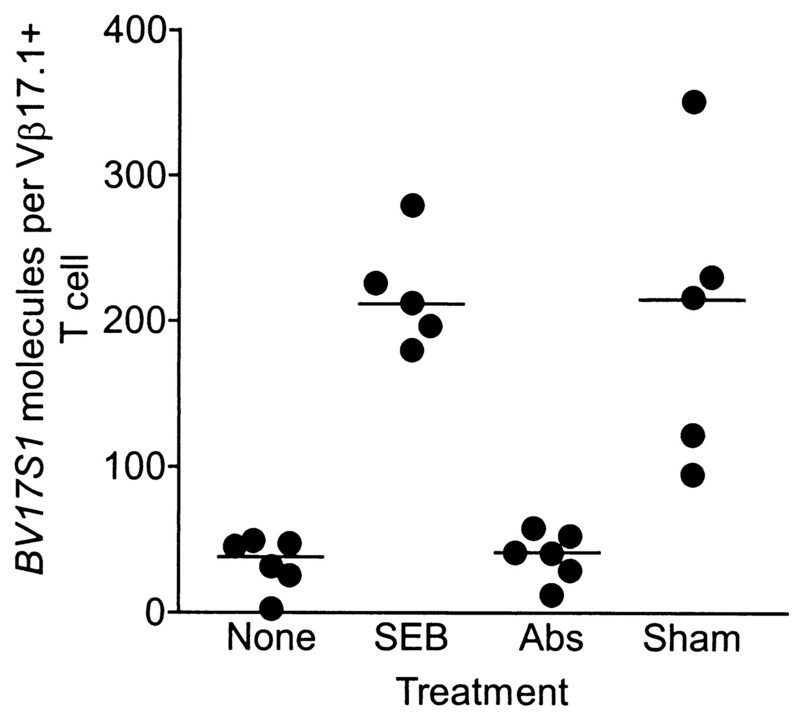 The lymphocytes from five separate individuals were stimulated with either SEB or TSST-1 (Fig. 7⇓). Elevated intracellular levels of TCRBV2S1 mRNA were only observed in TSST-1-stimulated cultures (p = 0.005). The largest increase in intracellular TCRBV3S1 mRNA levels was observed in the SEB-stimulated cultures (p = 0.005, compared with all other groups). The Vβ2.1+, anti-HLA-DRB1*0401-specific T cell clone, AY27, was cultured for 3 days in the presence of HLA-DRB1*0401-positive EBV B cells (DAL), syngeneic EBV B cells (CHOP40), or CHOP40 cells supplemented with either 10 ng/ml TSST-1 or 100 ng/ml SEB. Allogeneic B cells (DAL) and TSST-1 both induced a significant elevation in intracellular TCRBV2S1 mRNA levels compared with either syngeneic B cells (CHOP40) or the irrelevant superantigen, SEB (p < 0.005, in all cases). The intracellular TCRBV2S1 mRNA levels did not significantly differ between CHOP40- or SEB-stimulated control groups. Further, the intracellular TCRBV2S1 mRNA levels seen in the TSST-1- and the alloantigen-stimulated cultures did not significantly differ either (Fig. 8⇓). Taken together with these previous experiments, the data suggest that the magnitude of the intracellular TCRBV mRNA responses is independent of the nature of the Ag used for T cell triggering. To determine whether other factors induced by superantigen stimulation (such as cytokines) could also increase TCRBV mRNA production, PBMC were stimulated for 3 days with SEB. The supernatants from these cells were pooled and half the pool was passed through an anti-SEB column and the other half through a sham IgG column. The flow-through was sterilized by filtration and added to freshly prepared mononuclear cells in culture. After 3 days, the intracellular TCRBV17S1 mRNA levels were assayed and compared with SEB or control cultures (Fig. 9⇓). Absorption of SEB abrogated the ability of culture supernatants to induce the increased TCRBV17S1 mRNA levels seen in the SEB- or sham-treated supernatant cultures (p = 0.005, in each case). The intracellular TCRBV17S1 mRNA levels seen in cells incubated with the absorbed supernatant did not significantly differ from those found in cells cultured in medium alone. These data suggest that, even in circumstances where the majority of T cells may be activated, Ag is still the most significant soluble factor responsible for increased TCRBV gene transcription. The foregoing experiments suggest that intracellular TCRBV mRNA levels differ between different genes. TCRBV17S1 mRNA production would appear to be less than TCRBV3S1 which, in turn, appears lower than TCRBV2S1. Further, the level of TCRBV transcription seems to be an inherent property of the gene rather than the Ag used to stimulate it. To investigate this, Jurkat T cells were transfected with the promoters of the TCRBV17S1, TCRBV3S1, and TCRBV2S1 genes, and cloned into luciferase reporter constructs as described. After 40 h, incubation in either medium alone or medium supplemented with PMA, the luciferase activity of these transfected Jurkat T cells were assayed (Fig. 10⇓). The basal levels of gene transcription significantly differed (p = 0.005, in each case except between TCRBV2S1 and TCRBV3S1 when p = 0.01) with TCRBV2S1 having the highest, TCRBV3S1 the next highest, and TCRBV17S1 promoter the lowest transcription activity. After stimulation with PMA, the same statistically significant hierarchy of promoter activity was apparent (p = 0.005, in each case). The stimulated activity of each promoter was considerably greater than the equivalent activity of the promoter in cultures lacking PMA. However, the magnitude of the increase in promoter activity stimulated by PMA differed between the various genes studied. These results confirm the relative levels of promoter activity seen in the superantigen-driven cultures in vitro. Furthermore, they confirm that pharmacological agents, which mimic the biochemical events induced by TCR stimulation, are also able to increase TCRBV promoter activity. The results of this paper show, for the first time, that Ag triggering selectively increases TCRBV gene transcription. The increase in transcription is not dependent on the specific Ag that binds the TCR, but appears to be determined by the TCR gene’s upstream promoter. Each of the TCRBV genes examined was under the control of its own distinct promoter, and each had different levels of activity both at rest and after PMA stimulation. Previous studies have shown that PKC stimulation may lead to increased TCR mRNA levels, but it has been unclear whether every factor capable of stimulating T cell PKC could achieve this (9, 10). Furthermore, studies have variously demonstrated either that increased TCRBV transcription only occurs in some Ag-stimulated T cells or conversely, that all T cells exhibit this phenomenon in an active immune lesion (16, 17). Our findings suggest that all TCRBV genes may exhibit increased transcription but only after direct stimulation with Ag. These findings are supported by the recent observation that T cells responsible for dominant TCRBV mRNA spectratypes in vivo are found at reduced frequencies from that expected if gene transcription rates were invariant (26). Supernatants, rich in cytokines and other soluble factors, derived from superantigen-stimulated T cell cultures were unable to induce increased TCRBV gene transcription once the Ag had been specifically absorbed. These findings are entirely consistent with the notion that increased gene transcription represents a homeostatic mechanism for replacing the cell-surface TCRs lost through the process of Ag triggering. To measure these changes in intracellular mRNA levels, we have developed a RT-PCR-ELISA method. This is a modification of an earlier assay described by Kohsaka et al. (22). It is capable of measuring 1000 molecules of cDNA or less and is unaffected by the natural genetic diversity characteristic of TCR gene recombination. As separate competitor standards are used for each TCRBV gene to be measured, the assay is unaffected by potential differences in PCR amplification efficiencies that may be a source of bias in other assays such as TCR gene family-specific PCR (FS-PCR) (27). Further, while all of our PCR are controlled by an internal standard, in FS-PCR the amplifications are compared with an unrelated standard (usually total TCRAC mRNA levels). Unlike FS-PCR, in which specific mRNA levels are given as a percentage of total mRNA, our RT-PCR-ELISA method measures an absolute number of mRNA molecules. The mutual exclusivity of our method allows each TCRBV transcription level to be reported independently. This means that either a single T cell or multiple combinations of Ag-triggered T cells can be identified within the same immune reaction, as demonstrated by the elevations in intracellular TCRBV3S1 and TCRBV17S1 mRNA levels observed in the same cultures after triggering with either SEB or SEC-1. Our triggering experiments suggest that increased TCRBV transcription is an all or none event. SEB and SEC-2, which both bind Vβ17.1+ TCRs, trigger a similar amount of TCRBV17S1 gene transcription in T cells derived from a single individual (28, 29). Similarly, SEB and SEC-1, which bind Vβ3.1+ receptors, also induce equivalent levels of TCRBV3S1 transcription (28, 29). Further, experiments using the Vβ2.1+ T cell clone, AY27, demonstrate that comparable increases in TCRBV2S1 mRNA levels can be seen after stimulation with either conventionally processed alloantigen or superantigen. SEC-1 also induces a level of TCRBV17S1 transcription akin to that found after SEC-2 and SEB stimulation. The ability of SEC-1 to stimulate Vβ17+ T cells has not been previously reported. We have now shown that SEC-1 induces both increased TCRBV17S1 gene transcription and CD69 expression (30) on the Vβ17+ PBLs of this normal subject and five other unrelated individuals besides (data not shown), confirming the ability of TCRBV gene transcription analysis to detect Ag-triggered T cells. In assays where the TCR is not bound by the Ag, such as SEC-2 and Vβ3.1, and SEB and Vβ2.1, no increases in intracellular mRNA above control levels are observed. Incidentally, TCRBV2S1 transcription is similarly unaffected by SEC-1 and SEC-2 stimulation, both of which also fail to bind the Vβ2.1 TCR (data not shown). The only exception to this appears to be TSST-1. TSST-1 binds to Vβ2.1 TCRs and causes unambiguous elevation of TCRBV2S1 mRNA levels (28, 29, 31). It has no effect on TCRBV17S1 transcription (data not shown), but does cause a small but significant elevation of TCRBV3S1 transcription in all subjects tested. This elevation is about a sixth of that seen with optimal doses of SEC-1 or SEB. Even 1% of the optimal dose of SEB leads to significantly higher intracellular TCRBV3S1 mRNA levels than that seen in TSST-1 cultures (data not shown). Given the difficulty in obtaining pure commercial preparations of TSST-1 and that the impurities may have significant biological activity, we suggest that this effect is due to contaminants present within the TSST-1 preparation (32, 33). TCRBV gene transcription levels appear to differ depending on the gene studied. Intracellular levels of TCRBV17S1 mRNA are consistently less than TCRBV3S1 mRNA levels after stimulation with the same Ag. This difference was statistically significant (p < 0.05) but was only tested in a single individual. The median level of intracellular TCRBV3S1 mRNA measured in a group of subjects after SEB stimulation is lower than the level of TCRBV2S1 mRNA observed after culture with TSST-1. This finding is not statistically significant, and the absolute levels of gene transcription between individuals appear quite variable. As TCRBV genes are each under the control of their own upstream promoter, we tested the possibility that these observations reflected variations in the level of promoter activity. Reporter gene assays using upstream sequences from each of these genes confirmed that there were significant differences in activity between these promoters. Pharmacological mimicry of biochemical events following TCR triggering using the phorbol ester, PMA, confirmed that TCRBV gene transcription increases in every case. In addition, the degree by which promoter activity increased after PMA treatment also varied between the different genes. Further, the hierarchy of promoter function seen in these experiments mirrors that observed after lymphocyte stimulation. 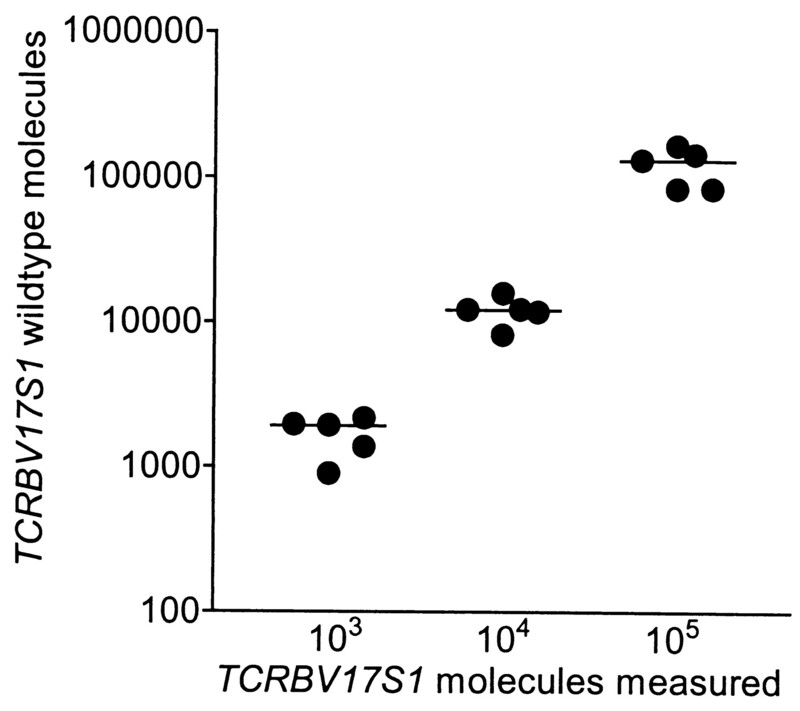 Namely, TCRBV2S1 promoter activity is greater than TCRBV3S1, which in turn is greater than TCRBV17S1. 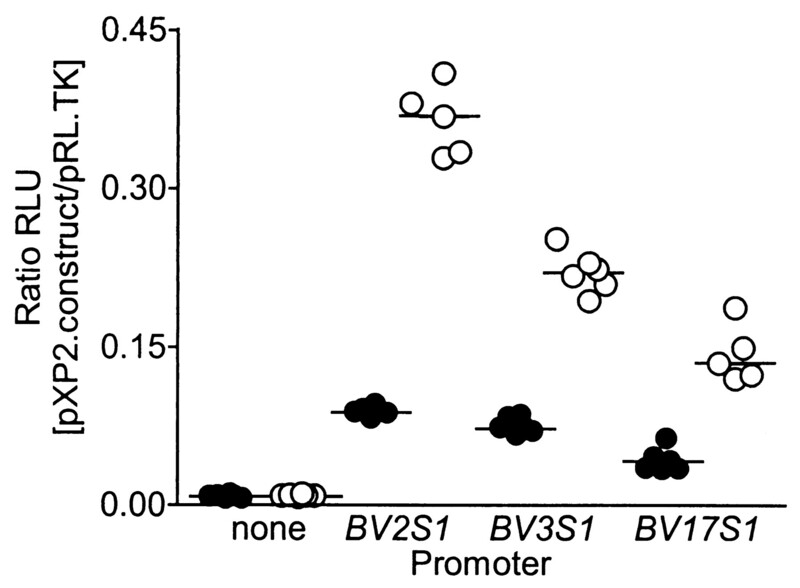 Similar variations in the basal levels of promoter activity between different TCRBV genes have been reported recently (21). One reason for the consistency of the reporter gene experiments compared with the lymphocyte stimulation assays may be that the former measures the activity of a single cloned sequence. We have evidence that significant differences in promoter activity may be associated with different allelic forms of the same promoter (data not shown). It may be that the variability in TCRBV mRNA levels seen between different individuals reflects functional polymorphisms in the respective gene promoters. Two conclusions follow from this work. First, other factors besides T cell number affect TCRBV mRNA levels. Indeed, specific TCRBV mRNA levels are determined by three factors: the particular TCRBV gene involved, the number of cells producing that mRNA in the sample tested, and whether all, some, or none of those cells are being triggered by Ag. This may be one explanation why previous studies using TCRBV repertoire analysis have inconsistently identified the pathogenic T cells in a number of human diseases (34, 35). Finally, our data support the contention that once normal ranges for Ag-triggered and basal transcription levels have been established for all the TCRBV genes, it should be possible to identify Ag-triggered T cells in vivo without prior knowledge of either the stimulating Ag or the responding TCR. ↵1 This work was funded by the Arthritis Research Council, Tenovus Tayside, the Medical Research Council, and AstraZeneca Ltd.
↵3 Abbreviations used in this paper: PKC, protein kinase C; SEB, staphylococcal enterotoxin B; SEC-1, staphylococcal enterotoxin C1; SEC-2, staphylococcal enterotoxin C2; TSST-1, toxic shock syndrome toxin-1; TCRBV gene, TCR β-chain variable gene; TMB, 3,3′,5,5′-tetramethylbenzidine.